In 2005, the Bernstein Center Munich started out with eight Principal Investigators (theory groups: A. Borst, S. Glasauer, J.L. van Hemmen; experimental groups: A. Borst, T. Brandt, U. Büttner, B. Grothe; technical groups: G. Färber, W. Hemmert) that had teamed up to mainly carry out interdisciplinary tandem-projects with multiple interactions. Based on funding from the BMBF and long-term support by the Technical University Munich (TUM) and the Ludwig-Maximilians-Universität München (LUM) two new Faculty Positions were established that were filled with Werner Hemmert (TUM) and Christian Leibold (LMU). By the end of the first five-year BMBF funding period, the Bernstein Center Munich had grown to 17 Principal Investigators at LMU, TUM, MPI and Infineon; in parallel, its scientific scope expanded greatly and numerous papers had been published. Therefore, the Center has been able to play a key role in establishing, shaping and supporting new closely related collaborative research and training centers – from basic neuroscience to technical application and towards clinical translation. 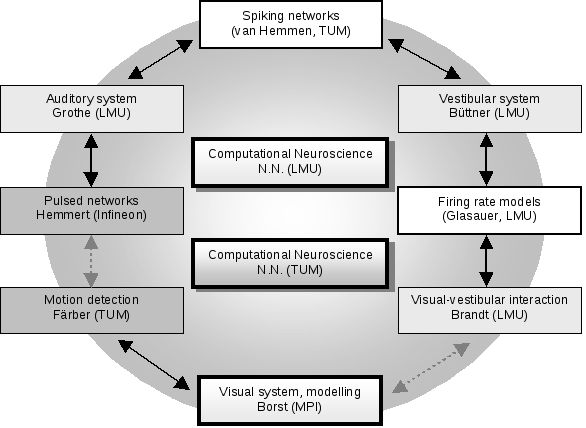 This has resulted in a large and dense research network in the Munich area with a strong computational neuroscience component whose further development is supported by a second BMBF grant that is currently funding the Center as well as various sustainability measures of the host institutions. 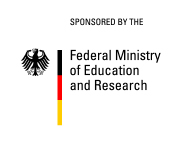 Details on the research projects during the first funding period of the Bernstein Center Munich can be found here.